Lacey Chabert! That’s one of the reasons why I first was interested in watching this Christian movie! I’ve always enjoyed the movies Lacey’s worked on, specifically with her being sort of the queen of Hallmark Channel movies, I’ve seen a bunch of them. I also admire Lacey’s constant involvement in projects that are family-friendly. She’s been very vocal about being a part of projects that make people feel good, one that shares a positive message and takes people to a wonderful story. I love that she’s also been very vocal about her faith and being a part of projects that represent that, like this one. Christian Mingle is about a hard-working executive in marketing who tries to find the right man for her on a Christian dating website. When she finds the right one, all she does is try to impress him and things go south but it leads her to discover something she hadn’t found before, faith. 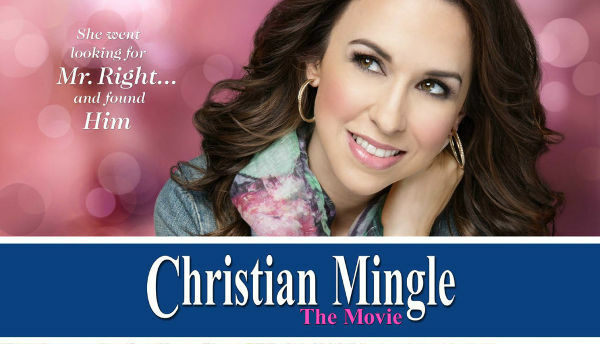 Starring in Christian Mingle is as I mentioned before, Lacey Chabert and also Jonathan Patrick Moore. At the beginning of this Christian movie, we met Gwyneth Hayden (played by Lacey Chabert). She’s a very busy and hard-working executive who because of this has not been very successful in the love department. It seems like everyone around her has found somebody or is becoming engaged. One of her closest friends becomes engaged and now for certain, she is the only single girl of her group of friends. So as she’s circling the internet, Gwyneth spots an ad for a Christian dating site, Christian Mingle to be exact and without nothing to lose she goes for it and signs up. Soon Gwyneth lands a date with Paul (played by Jonathan Patrick Moore) but in preparation for it she panics and tells her friend that she had lost her involvement in church many years before even though she was raised a Christian. So in need of enlightenment before her date with Paul, Gwyneth grabs some books to help her in the Christianity and Bible department. Both Gwyneth and Paul make a great impression on each other and continue to date although Gwyneth has to study before. Later on, Paul takes her to a Bible study at a friend’s house and there Gwyneth meets all his friends. Even some of them met through the dating site that pointed Paul and Gwyneth together, Christian Mingle. As their relationship progresses, Paul takes Gwyneth to church and she meets his parents, Lacie and Bill, a daunting step for Gwyneth. Now, there’s an upcoming twist for Gwyneth. When she meets with Paul’s friends, he makes the announcement about his mission trip with his father’s building company to help the people of a small town in Mexico and fix their church. This is a complete surprise to Gwyneth and is somewhat stunned that Paul hadn’t told her before. But later she is persuaded and joins Paul and everyone involved in the mission to Mexico. She takes some days off from her demanding job and finds herself in Mexico being involved in things she never thought to do before. But there her book about “How to be a Christian” is discovered, she comes clean to Paul and tells him that she wasn’t practicing Christianity when she went to the dating site or when she started seeing him. This doesn’t sound well to Paul, therefore, their relationship comes to an end at that point and she goes back to the U.S. At this point, Gwyneth doesn’t feel good about what she did and a time later when Paul is back she goes to see him but he’s with someone else. Back at work, Gwyneth’s boss makes her create a campaign about selling a solution for baldness but her boss knows and she knows that the product their selling does not work. She denies doing the campaign because she can’t lie now because of her newly found faith and quits her job. Gwyneth decides to go back to Mexico and becomes an English teacher in the village she had visited before. Christian Mingle has some very real truths like for example that through our faith, God can redeem us and give as many chances as needed. Also that we may look for love in different places but the love God gives is the utmost important one to receive.